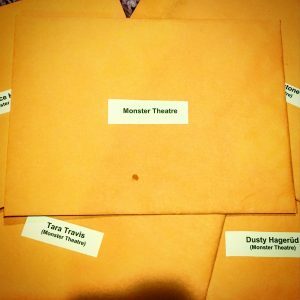 Monster Theatre Nominated for SEVEN Jessie Richardson Awards! Outstanding Direction (Ryan Gladstone), Outstanding Production and Significant Artistic Achievement – Small Theatre: Outstanding puppetry design, creation, execution and performance (Tara Travis and Dusty Hagerud). Outstanding Production, Outstanding Performance (Alex Gullason, Carly Pokoradi and Frankie Cottrell) and Significant Artistic Achievement for the Song Writing (Bruce Horak, Ryan Gladstone, Jeff Gladstone, Wes Borg).